Understand the connection between relative frequency and probability. Gain experience of designing and carrying out a probability experiment. Calculate a theoretical probability for a practical scenario. 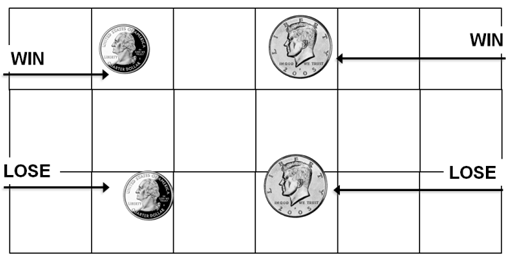 Before the lesson, students attempt the Throwing a Coin task individually. You then review their responses and create questions for students to consider to help them to improve their work. Next, students work in pairs or threes, combining their thinking and working together to decide which game design will make the most money for charity. In the same small groups, students evaluate sample responses and compare each approach with their own ideas. They then review their work to ensure they are happy with and can justify their solution. In a final whole-class discussion, students share their work and consider the advantages and disadvantages of the approaches taken. In a follow-up lesson, students reflect on how they have worked. Each student will need the assessment task Throwing a Coin, some plain paper to work on, a mini-whiteboard, pen and eraser, and the How Did You Work? questionnaire. Calculators and rules should be made available on request. Each small group of students will need plain paper to work, a copy of the Game Board, a quarter, a 50-cent piece, and the Sample Responses to Discuss. 15 minutes before the lesson, a 110-minute lesson (or two shorter lessons), and 15 minutes in a follow-up lesson. Timings are approximate and will depend on the needs of the class.